JoJo’s Bizarre Adventure is a stark contrast to other fighting games in nearly every aspect. 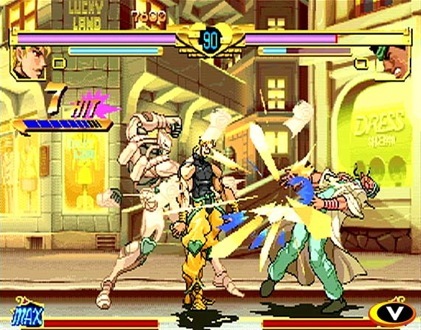 Developed by Capcom, it was released for the Sega Dreamcast in 2000 with the original and revised arcade games on the same disc, similar to how Street Fighter III: Double Impact was sold. Based off a popular manga, the story has been distilled to just the facts; Jotaro and his friends are trying to kill the evil Dio and Dio is trying to kill them. While the story is stock, the way it is presented is not. Each character has an individual story arc complete with marvelous sprite-based cut scenes. They can come off as a little drawn out, but it helps separate the game from other fighters whose stories are merely tacked on. The vibrant graphics, level and character design are a welcome change of pace from today’s palate of brown and steel and are in keeping with the manga visual style. 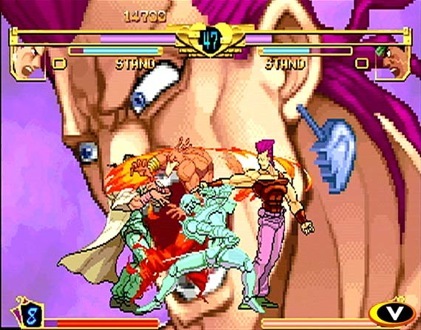 But what really set JoJo’s Bizarre Adventure apart from its peers is the game play. In most fighting games, there is a basic play style that is slightly varied for each character. In JoJo’s Bizarre Adventure, each character plays completely distinctive from one another because of the Stand System. Each character is master of a unique stand, which I can only describe as a ghost that follows them. You can fight as the main character, but your move set and powers are limited. 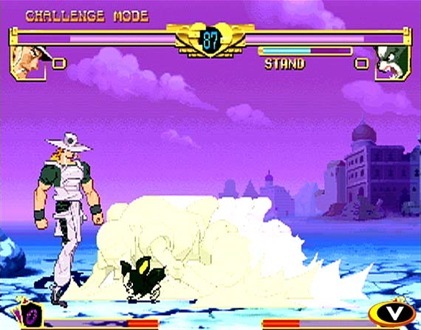 The game play most often completely changes when you activate a stand. Stands can be anything from a sword, a sand monster, a gun, a demon and the list goes on and on. Lets highlight two very different stands to try and convey how the varying fighting style in the games: Ebony Devil and Sethan. D’Bo is a Native American shaman hired as an assassin by Dio to kill Jotaro and his friends. Before triggering his stand, D’Bo is a brutish, strength-based fighter. When his stand Ebony Devil (based off the Devil tarot card) is in action, you take control of a demonic, cleaver-wielding puppet. Unlike other stands, the puppet and D’Bo are separate and can be on opposite sides of the screen. When deactivating the stand, the puppet remains where it was last played, waiting for the devil to once again enter him and continue his murderous deeds. Because opponents always face toward the human master, playing with D’Bo can be a challenge. Since D’Bo and Ebony Devil are two separate entities, opponents can get some open shots on D’Bo when the stand is activated. However, this also means the enemy’s back can be left open, making unguarded combos easier to achieve. Alessy is another assassin hired by Dio to kill Jotaro (this Dio guy must have a lot of dough, and yes I’ve seen that his name is “Alessi” in the manga, but in this game its spelled Alessy so sit on it). His fighting style is loony, a little sloppy but fairly quick. His stand, Sethan, is a shadow that looms on the ground. It extends the attack reach as well as his defense by jutting out in front of Aleesy, making it very awkward to score hits. When stepped upon, Sethan can make his opposition younger, making them pint-sized and much less powerful in the process. These two characters’ play styles vary from one another, and this is the case for every character in the game. Other fighting games may generate a similar feeling, but none do to the degree JoJo’s Bizarre Adventure does. Let us look at the Street Fighter series to compare. In Street Fighter, every character has different power levels, reach, jumping capability, etc. But the basic mechanic of three punches, three kicks, combos, and supers combos is the constant through each character. This makes Street Fighter players strategize how to best utilize their character against their opponent’s strengths and weaknesses. JoJo’s Bizarre Adventure makes this mode of thinking near immeasurable since each stand varies wildly. The only way to get a true feeling for JoJo’s Bizarre Adventure is to play as every character. Even if you are a fighting game savant or have months and months to dedicate, you may never master all of the characters in the game. This makes the thrill of fighting others more extraordinary since even seasoned veterans may not know what their rivals may throw at them. First time players may be put off by what could easily rival Marvel vs. Capcom 2 in madness and by getting lost in unfamiliar controls. The game balances this as well with an easy mode. Similar to the simplified controls found in Tatsunoko Vs. Capcom, two face buttons are assigned to special moves and the left trigger is mapped to an ultra combo, making any rookie decent enough to hold there own and have fun playing against their much better friends. JoJo’s Bizzare Adventure is a discombobulating game if you let it get to you. But if you open your mind and are ready to see ghosts, demons, Cadillacs, light gun cursors, giant mouths chew upon you, or any number of oddities, you will have a fantastic time and you might expand you notions of what a game can be. By experiencing different play mechanics and general unconventionality, you will see that games do not have to set in the stone of what others have done before. Isn’t the best part of Bioshock the plasmid system? Wasn’t it a thrill to roll around in Katamari Damacy? Wasn’t it great working with people to kill zombies in Left 4 Dead? Games that take a chance on introducing new ideas are always held in higher regards than retreads. The unknown ceiling of success may scare publishers who want to know they will make a profit, even if slight, but that uncertainty gives these games the space to hit levels of creativity and triumph that can reach higher than anyone could have ever suspected. A tiny dog is a playable character. Cute! JoJo’s Bizarre Adventure is, sadly, mostly forgotten now. It’s an orphan. But as another orphan, the poet John Keats, once wrote, “There let its trumpet blow, and quickly dress, My uncertain path with green, that I may speed, Easily onward, thorough flowers and weed. “ JoJo’s Bizarre Adventure blazed a path through weeds and delivered us flowers of unprecedented beauty. And by taking a risk with its game pay, it’s made easier for new ideas to come into the fighting game genre. 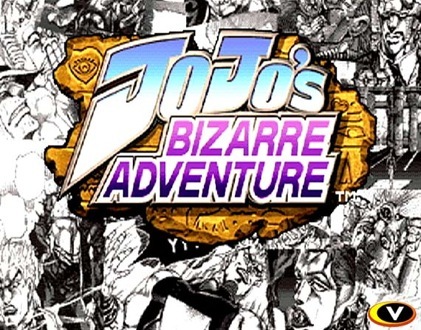 If you seek this game out, JoJo’s Bizarre Adventure will beguile you. You’ll be so surprised by it’s unparalleled qualities that you will be talking and thinking about this game, and you will be showing it to your friends. 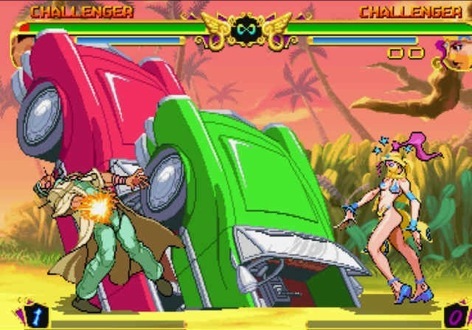 JoJo’s Bizzare Adventure is one of Capcom’s many gems for the Dreamcast, but it shines and dazzles unlike any other. Nice write up. This is one of my favorite fighting games and I unfortunately no longer own a copy. Traded it a few years ago and then realized what a mistake I had made. I love this game. It’s one of the few that lives up to its name. Also, Capcom should have done more stuff for the CPS3 hardware. I always find myself gravitating towards the more creative fighting games like this one. I never understood why reviews were always so mixed.